While rice is cooking, spray large skillet with nonstick cooking spray. Heat over medium-high heat until hot. Add pork; cook and stir 3 to 5 minutes or until no longer pink. Add bell pepper; cook and stir 4 to 6 minutes or until crisp-tender. Stir in pineapple, sweet and sour sauce and ginger; cook and stir until thoroughly heated. Serve over rice. Tenderloin is one of the leanest cuts of pork. A 3-ounce cooked portion contains only about 4 grams of fat. It’s easier to thinly slice pork if it’s partially frozen. Freeze the pork for about 30 minutes before cutting it. 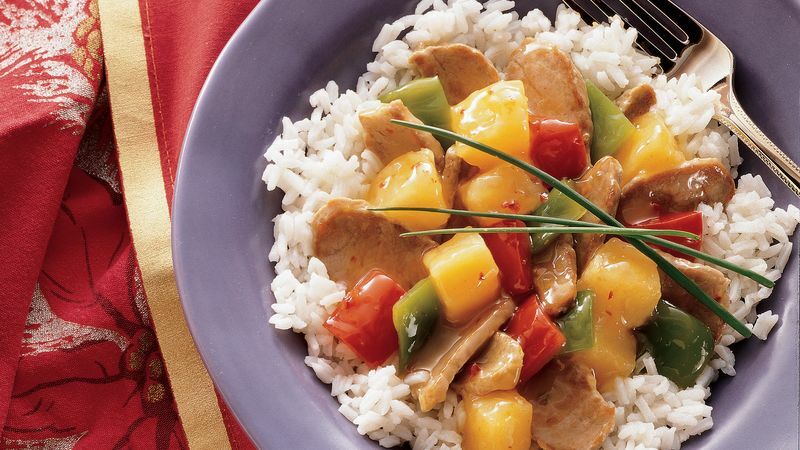 For more color and sweet flavor, use half a red bell pepper along with half a green bell pepper.